The Simpsons™: Tapped Out – Games for Android 2018 – Free download. 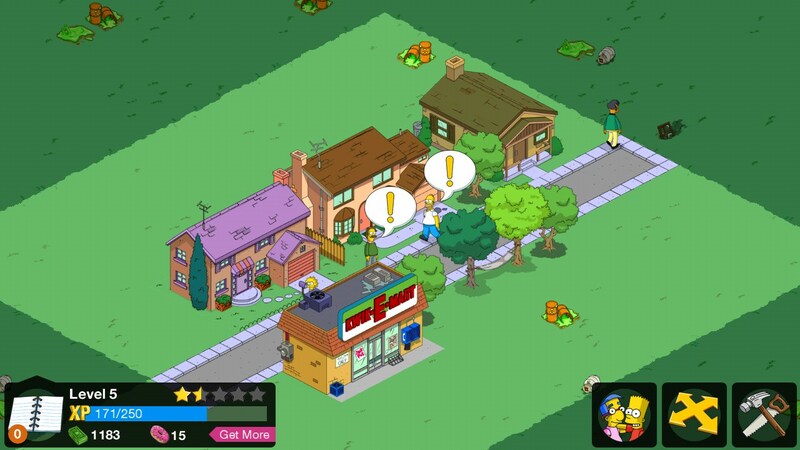 The Simpsons™: Tapped Out – Under construction Springfield from the start. 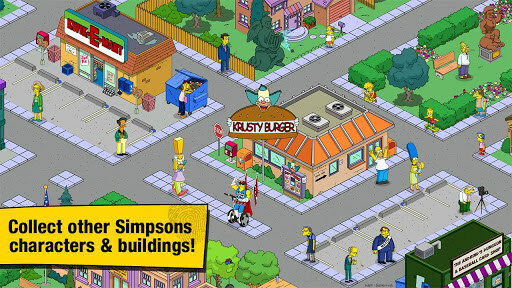 The Simpsons: Tapped Out is a highly addictive city management simulator game for Android devices. 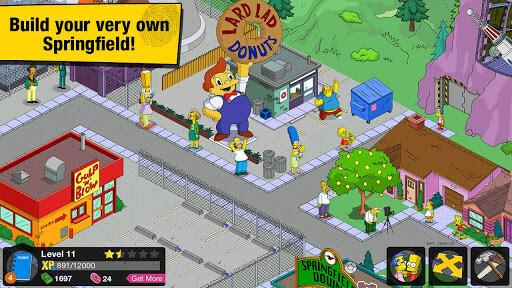 The game is really funny and features real-time game play that lets you dive into the quality drawn world of Simpsons and help all famous characters build Springfield from scratch. The game was developed by EA Swiss Sarl and that means that it’s definitely worth playing. It features awesome graphics, lots of incredibly funny dialogues, exciting game play, and simple controls. It turned out that Homer distracted way too much playing his tablet at work at the factory and missed an emergency alarm. In the end, Springfield got blown up and now it’ll be you who will need to rebuild it from scratch. The game controls are easy and you will need to tap the menu and swipe the screen to place buildings and carry out tasks. The more buildings you have, the more people from Springfield come back to the city. Mind that the game is played real-time and some tasks or buildings will take a while to get finished. For every completed task you will receive money and experience which you will use to buy stuff in-game like new decorations and so on. You can invite your friends from Facebook to join you and interact with them on the map. The only drawback this game has is that some building or tasks simply take too much time to complete. You can finish them in an instant by paying doughnuts, the in-game currency, but once you’ve spent all your free money, you will need to pay cash to purchase them. 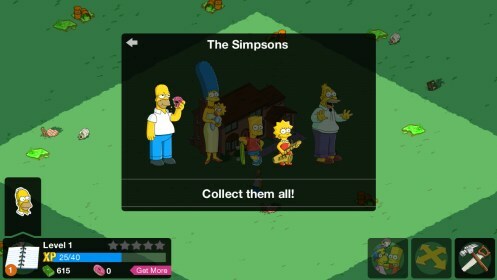 The Simpsons: Tapped Out is an awesome game for Android that is really addictive and funny. Build Springfield the way you want and control all characters from this universe. Invite friends and have fun! When i try to open the app, it goes back to the phone homepage..any suggestions? Try re-installing the app to see if there was an issue with the installation. Crashes when I try to clean up garbage during the monorail event. Does not let me type in text boxes (I type in one letter and the keyboard closes and won't re-open). I have recently upgraded to an s5. 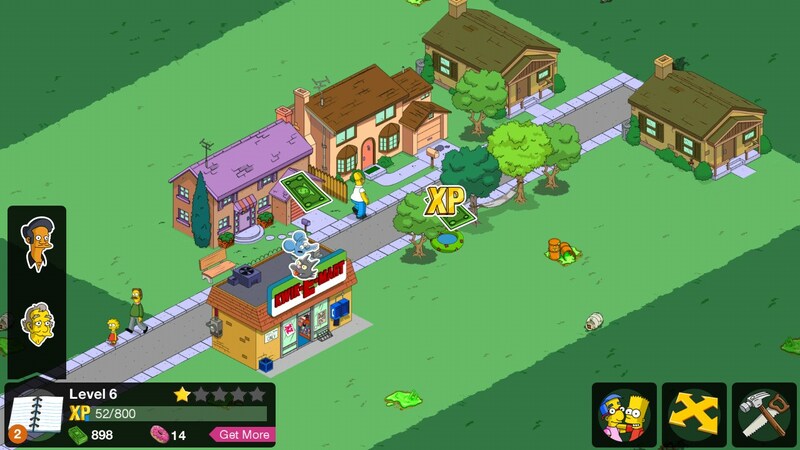 I downloaded simpsons tapped out as played it on my s3. It initially came on did updates and now every time I go to play it it loads a black screen n takes me bk to my fone menu. What can I do?? Unfortunately Tapped Out has a well documented history of crashes. 1) Uninstall the app from your S5 and restart the device. 2) Reinstall the app from the links provided above. 4) Attempt to launch the app. Total waste of money for the s5. My s2 played it no problem. I have been using this game for 2 years on galaxy s3 and have upgraded to s5 today and it won't even load. Any suggestions? Please describe the issue in a bit more detail. Did you encounter any issues while downloading or simply launching the app? Does it crash to the homescreen and does it display an error message? I believe it should work on the device. What exactly is the behavior when attempting to download and install the game? I always played tapped out every day, bud last week i upgraded my Xperia Sp with android 4.3 and at with the new androdi Simpsons not working, in google play store is label with, not cmpatible with your phone, what the hell.. Anybody why?? this wont load on a samsung galaxy neo - why not ?? says device is not compatible ?? I have it on my Kindle an it won't let me download the new update on th Amazon playstore. I just got an Xperia SP but can't download Simpsons tapped out on it is there anyway to get it on my SP ??? Received update today, and as a result no longer working with HTC Sensation, anyone else having this problem and know how to solve it? I was playing it last night!! I recently got the Sony Xperia SP and it says the game int compatible, but it meets all the requirements. Pissin me right off!!!! I played for a ling time on my kindle fire and all of a suddenit stopped so I think they would pull it. I have the same problem Dan. I'd give it a few days to a week. They'll eventually release a patch or whatever to make it compatible again with your htc. Since the game has been updated does it work on htc desire s anymore? keeps say not compatible. when it worked before. HELPPPP!!!!! I have it for my galaxy but can't add friends it always says failed how do I add someone so I can get rid of my 600 plus snake eggs? Google and Amazon should yank the game all together since EA isn't telling anyone why the game isn't comptable with the TF700T Asus Infinity pad. It runs on the nexus 10, the TF300 and all the other Asus pads. According to the requirements page for Simpsons, the TF700T more then exceeds the requirements. Since they are playing a political game of Poop, I would like to see see someone shat on the windshield of a exec at their HQ in the Bay area off of 101fwy! This game does not work on Asus Transformer Infinity Tf700. as I have been waiting forever for it.